Results Data were extracted from a total of 48 identified studies. Achieving sustained virological response (SVR) was associated with reduced extrahepatic mortality (vs no SVR, OR 0.44 (95% CI 0.28 to 0.67)). SVR was associated with higher complete remissions in patients with cryoglobulinemia vasculitis (OR 20.76 (6.73 to 64.05)) and a higher objective response in those with malignant B-cell lymphoproliferative diseases (OR 6.49 (2.02 to 20.85)). Achieving SVR was also associated with reduced insulin resistance at follow-up (OR 0.42 (0.33 to 0.53)) and a significant protective effect on the incidence of diabetes (OR 0.34 (0.21 to 0.56)). Lack of randomised data comparing SVR versus non-SVR patients for the relevant extrahepatic indications attenuated these analyses. Chronic HCV all-cause mortality was found to be double that of HCV-negative individuals. While liver cirrhosis and hepatocellular carcinoma account for many of HCV-related deaths, extrahepatic manifestations have been demonstrated to play a role in HCV mortality rates. In patients with chronic HCV infection, achieving sustained virological response (SVR) versus no SVR was associated with reduced extrahepatic mortality. SVR was associated with higher complete remissions in patients with cryoglobulinemia vasculitis and a higher objective response in those with malignant B-cell lymphoproliferative diseases. Achieving SVR was also associated with a good impact on glucose metabolism, that is, reduced insulin resistance at follow-up, and a significant protective effect on the incidence of diabetes. Extrahepatic manifestations in HCV-infected patients are independent of the severity of the liver disease. Antiviral therapy can reduce hepatic manifestations of HCV and also many extrahepatic manifestations related to HCV when SVR is achieved. Autoimmune and lymphoproliferative disorders were among the first extrahepatic manifestations associated with HCV infection to have been reported, ranging from cryoglobulinemia vasculitis to malignant B-cell lymphoma.10 Large cohort studies have since revealed additional extrahepatic manifestations, including cardiovascular, neurological, metabolic and renal conditions.5–9 11 12 And multiple manifestations often coexist in the same patient. Altogether, these findings highlight the public health burden of extrahepatic manifestations associated with HCV infection. Treatment of HCV-infected patients therefore demands complex multidisciplinary management.13 Alternatively, a curative panoptic approach of viral eradication has been reported to reduce extrahepatic mortality.11 12 14 15 Antiviral therapy has since become more attractive with the advent of direct-acting antiviral agents; the reduced duration of such orally administered regimens has been shown to result in greater than 90% cure rates.1 The need for effective viral eradication measures is thus suggested. 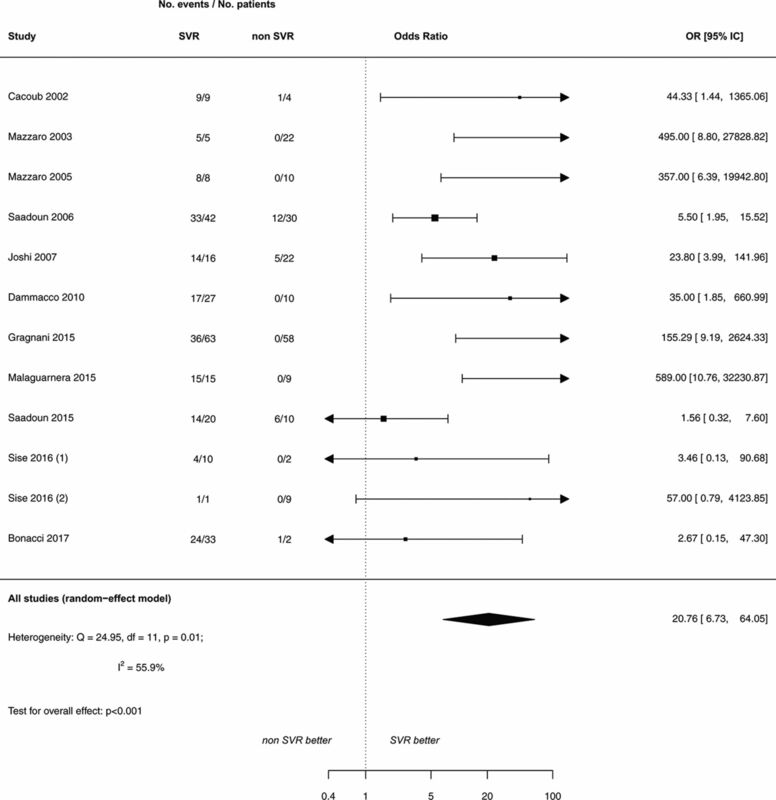 The aim of this study is to assess the impact of achieving sustained virological response (SVR) to antiviral treatments on the extrahepatic morbidity and mortality in patients with chronic hepatitis C.
Here, the results of a systematic review and meta-analysis are presented, providing an overview of the currently available evidence for an alleviation of extrahepatic manifestations on achieving SVR. A systematic review of the literature was conducted in line with the Preferred Reporting Items for Systematic Reviews and Meta-Analyses guidelines.16 Eligibility criteria for use in subsequent meta-analysis were developed, as outlined in the online supplementary appendix 1. Briefly, publications describing treatment interventions that assessed the effects of SVR versus a comparator group of non-SVR or untreated patients on extrahepatic mortality or morbidity were retained. Two investigators independently performed all of the screening of abstracts, data extraction, risk of bias and Grading of Recommendations Assessment, Development and Evaluation (GRADE) scoring described below. Any selection discrepancies were resolved by a third investigator. A comprehensive search of the literature for relevant English-language publications from 1989 until a data lock point of 19 June 2017 was conducted using the databases Embase and Medline, as detailed in the online supplementary appendix 2. Two sets of search queries sought those publications with the word ‘extrahepatic’ in the title, abstract or keywords, and in parallel individual searches were conducted using the appropriate MeSH or EMTREE terms for each commonly reported extrahepatic manifestation: overall extrahepatic mortality, cryoglobulinemia vasculitis, B-cell lymphoproliferative diseases, arthralgia/myalgia, sicca syndrome, cardiovascular diseases, renal insufficiency, insulin resistance, diabetes mellitus, fatigue, depression and cognitive impairment. All of those abstracts identified in the literature search were scanned, and those of potential interest were selected for full-text review. Additional articles were obtained through manual inspection of the most recent relevant meta-analyses found in the Cochrane library and among any articles identified. Only those studies with more than 10 patients that compared effects in SVR versus non-SVR patients compared with baseline in a two-arm analysis were selected. Effects on extrahepatic mortality as well as any reduction of the extrahepatic manifestations listed above were retained. Data were extracted on study characteristics, interventions, patient characteristics at baseline and outcomes for the study populations. The ROBINS-I tool was adapted and used to evaluate the risk of bias in non-randomised studies.15 Biases considered were reporting, confounding, attrition and disease progression, and each category was scored as high risk, low risk, unclear risk or not applicable. SAS V.9.4 software (SAS Institute, Cary, North Carolina, USA) was used for this meta-analysis. The analysis was conducted as 12 distinct meta-analyses to assess the 12 topics described above. A random-effects model was used to study the correlation of SVR and the reduction of extrahepatic morbidity and mortality for binary data, while continuous numerical scores were compared using standard mean differences. In the meta-analyses of dichotomous outcomes, we calculated the ORs with 95% CIs using 2×2 tables from the original articles to evaluate the efficacy of antiviral treatment between the SVR and no SVR groups whenever possible, or the treatment and control groups. Pooled-effect sizes with 95% CIs were calculated using a random-effects model using the Der Simonian and Laird method based on the inverse-variance approach. In the meta-analyses of continuous outcomes, we used the mean value and SD or changes from baseline and SD. When SDs were not provided, we performed within-study imputations to handle missing information from published studies. The available means and SD from all the studies with complete information were used to calculate the coefficient of variation (Bracken 1992). The standardised mean differences (SMDs) were calculated using the inverse-variance random-effects method. Heterogeneity was determined using the I2 test, which measures the percentage of total variation across studies. I2 was calculated as follows: I2 (%)=100×(Q−df)/Q, where Q is Cochrane’s heterogeneity statistic and df signifies the degree of freedom. Negative values for I2 were set to zero, and an I2 ≥75% was considered to be of substantial heterogeneity. Significance was set at P=0.05. The GRADE system, which classifies data as high, moderate, low and very low quality evidence, was used to assess the strength of evidence where comparative estimates of meta-analyses have been provided. No studies of randomised data comparing SVR versus non-SVR patients for the relevant extrahepatic indications were identified in the literature. As such, ‘high quality evidence’ could not be assigned to any of the ensuing meta-analyses. Scoring results were thus limited to moderate, low and very low quality, with +1, 0 or −1 being attributed for risk of bias, consistency of results (as scored by heterogeneity I²), precision (ie, P value, OR), publication bias and magnitude of effect. Risk of bias comparisons, as described in the previous section, were pooled to include all of the studies providing data for each meta-analysis. Consistency rose in those analyses wherein the heterogeneity of combined of direct evidence was limited (ie, an I2 <75%). Because no ‘true’ direct comparisons were identified in the literature and indirect evidence contributed to comparisons, indirectness rate was assigned neutral score of 0 for all studies. The level of precision was scored using the P value, for example, a score of +1 was assigned to those meta-analyses where the 95% CI around the OR was statistically significant (P<0.001) for a comparison. Publication bias was rated depending on the symmetrical or asymmetrical distribution of the studies as presented in the funnel plot. Finally, the magnitude of effect was positively rated when absolute effect difference was ≥10%. Embase and Medline searches for evidence of the effects of SVR on HCV extrahepatic manifestations yielded a total of 2270 articles after the removal of duplicates. Screening these abstracts eliminated 1886 articles as case studies or general review articles, or due to lack of relevant data. A further 57 articles were identified through manual screening of meta-analyses and other articles identified through the Cochrane database. Altogether, a total of 498 publications were obtained and reviewed in further detail. 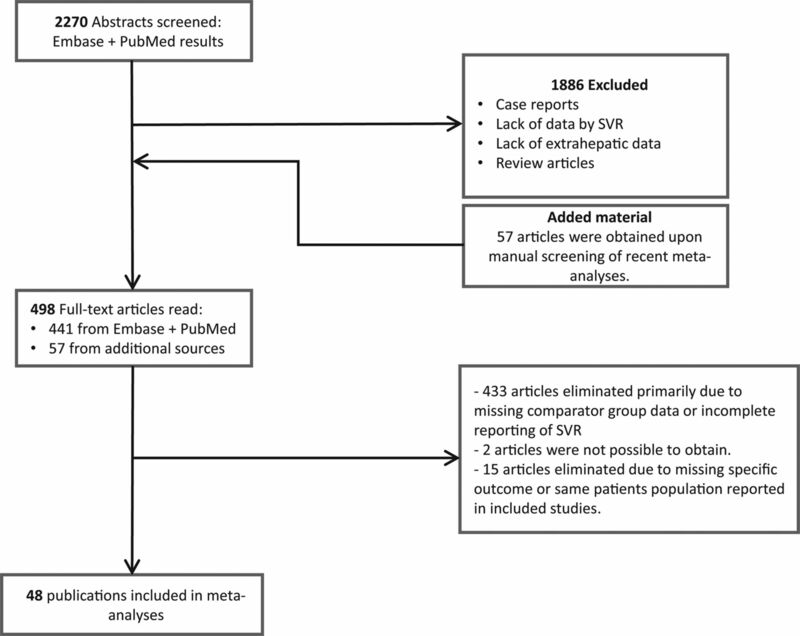 Of these, 48 studies contained extrahepatic outcome data that allowed for subsequent meta-analysis (figure 1). For three of the extrahepatic indications investigated, sicca syndrome, myalgia and cognitive impairment, no publications that would permit further analyses were identified. For all of the retained articles, patient baseline characteristics from these studies are summarised in online supplementary appendix 3. Preferred Reporting Items for Systematic Reviews and Meta-Analyses flow diagram for identification of relevant studies. SVR, sustained virological response. For each indication analysed, data source risk of bias scores (online supplementary appendix 4), together with the significance and magnitude of the observed effect, were part of the GRADE scoring of the quality and strength of evidence (online supplementary appendix 5). Of note, all data included herein required the extraction of selected patient subpopulations of SVR versus non-SVR, and was thus considered non-randomised. Four studies reported on extrahepatic mortality: three included all-comers HCV-infected patients (references), while one was restricted to HCV-infected patients with vasculitis.16 A random-effects model performed including all four studies showed that SVR achievement was correlated with a significant reduction in extrahepatic mortality: OR 0.44 (95% CI 0.28 to 0.67, P>0.001) (figure 2). Moreover, little heterogeneity between the populations was observed (I²=0.0%), and the strength of evidence was scored as moderate. Similar results were obtained when excluding the study restricted to patients presenting with vasculitis (online supplementary appendix 6). 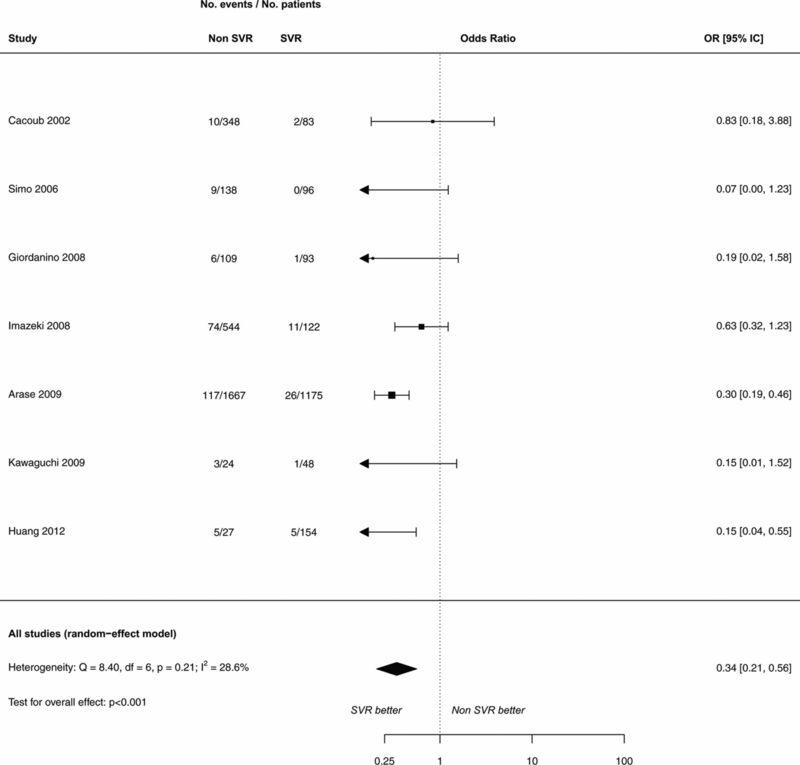 Impact of sustained virological response (SVR) on extrahepatic mortality: meta-analysis of extrahepatic mortality. A total of 16 selected studies reported on SVR and cryoglobulinemia vasculitis. Complete remission was reported in 11 studies while at least one observed improvement (including clinical, immunological or radiological) was reported in all 16 studies. A significant effect of SVR achievement on complete remission was observed: OR 20.76 (95% CI 6.73 to 64.05, P=0.01) (figure 3). The meta-analysis on any observed improvement showed similar results: OR 27.24 (95% CI 10.99 to 67.53, P=0.001) in favour of the SVR group (online supplementary appendix 7). A degree of asymmetry was observed in the funnel plots of these data; the strength of evidence is ‘Low’ (online supplementary appendix 4). 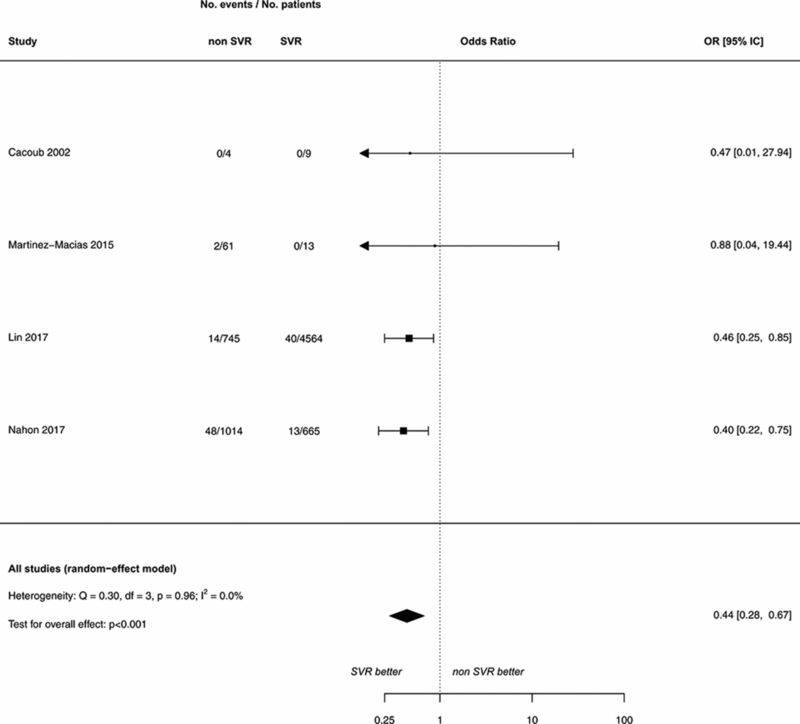 Impact of sustained virological response (SVR) on cryoglobulinemia vasculitis: meta-analysis of complete remission in patients with cryoglobulinemia vasculitis. Partial and complete responses were reported in five identified publications of the effect of achieving SVR on lymphoproliferative diseases. Random-effects model showed a significant effect of SVR achievement on objective responses: OR 6.49 (95% CI 2.02 to 20.85, P=0.0017) (figure 4). Impact of sustained virological response (SVR) on lymphoproliferative diseases: meta-analysis of objective responses in patients with malignant lymphoproliferative diseases. The effect of SVR on insulin resistance was studied in 11 of the identified studies. Data from four studies revealed a significant effect of SVR achievement on the frequency of insulin resistance in patients without diabetes: OR 0.42 (95% CI 0.33 to 0.53, P<0.001) (figure 5A). The data were found to be homogeneous (I²=0.0%), and no publication bias was observed. According to GRADE, the strength of evidence is ‘Moderate’ (online supplementary appendix 4). Impact of sustained virological response (SVR) on insulin resistance. (A) Meta-analysis of insulin resistance at follow-up in HCV-infected patients without diabetes at baseline (four studies). (B) Meta-analysis of mean homeostasis model assessment of insulin resistance in HCV-infected patients with or without diabetes (10 studies). The mean homeostasis model assessment of insulin resistance (HOMA-IR) score at follow-up was reported in 10 of the studies assessing insulin resistance in all HCV-infected patients (diabetes status at baseline not stated) (n=5 studies) or in HCV-infected patients without diabetes at baseline (n=5 studies). Standardised mean difference was of 0.66 point (95% CI 0.38 to 0.94, P<0.001) between SVR and non-SVR groups in the global meta-analysis, meaning that SVR achievement significantly reduced the mean HOMA-IR by approximately 0.66 (figure 5B). There was, however, a relatively high level of heterogeneity (I²=74.9%), with an asymmetry observed in the funnel plot of these data; the strength of evidence is ‘Low’ (online supplementary appendix 4). In a separate analysis, first excluding studies of HCV-infected patients without diabetes at baseline, similar results were observed: SMD=0.94 point (95% CI 0.61 to 1.26, P<0.001). The strength of evidence was scored as low by GRADE. Likewise, in patients without diabetes at baseline, meta-analysis showed also a significant effect with a SMD of 0.48 point (95% CI 0.05 to 0.92, P=0.0283). The strength of evidence is ‘Very Low’ according to GRADE (online supplementary appendix 4). Meta-analysis of data from seven studies showed that SVR achievement has a significant protective effect on diabetes frequency at follow-up: OR 0.34 (95% CI 0.21 to 0.56) (figure 6). The strength of evidence is ‘Moderate’ according to GRADE. In three of these studies that did not report diabetes status at baseline, a separate meta-analysis failed to show a significant effect of SVR. However, meta-analysis of four studies of HCV-infected patients clearly designated as being without diabetes at baseline revealed a significant protective effect of SVR achievement on the incidence of de novo diabetes: OR 0.27 (95% CI 0.18 to 0.40) (online supplementary appendix 8). The strength of evidence is ‘Moderate’ according to GRADE (online supplementary appendix 4). Impact of sustained virological response (SVR) on diabetes: meta-analysis of presence of diabetes after SVR achievement in HCV-infected patients. Two studies were identified that compared arthralgia in SVR versus non-SVR. Random-effects model performed including both studies showed a slight trend, however non-statistically significant, of SVR achievement reducing the incidence of arthralgia: OR 0.86 (95% CI 0.49 to 1.52) (online supplementary appendix 9). Two studies were identified that compared the incidence of cardiovascular events in SVR versus non-SVR. Data from these two studies could not, however, be pooled together because of the differences in the comparison groups (SVR vs non-SVR,17 and interferon-based treatment vs no treatment18). In the study of Nahon et al,17 a significant effect of SVR achievement on the incidence of major adverse cardiovascular events was reported (OR 0.37 (95% CI 0.59 to 0.84)) (online supplementary appendix 10B). Data from Hsu et al 18 were used to perform a second random-effects model that demonstrates a reduction in the incidence of ischaemic events in patients treated for HCV infection: OR 0.70 (95% CI 0.07 to 0.31) (online supplementary appendix 10B). Although three publications were identified that assessed the effect of HCV treatment on the reduction of renal events (including end-stage renal disease, dialysis and chronic kidney disease),12 all appear to have analysed data from a single population. Retaining the largest data set here to demonstrate the observed effects18 revealed the effect of treatment (primarily interferon based) on reducing renal events: OR 0.15 (95% CI 0.07 to 0.31) (online supplementary appendix 11). Eight publications analysing the impact of SVR achievement on fatigue were identified; they presented data from a total of 10 different studies. As a variety of different tools are used to measure fatigue, separate analyses were performed where comparisons were feasible. A random-effects model performed on results from two studies shows the effect of SVR achievement in reducing the presence of fatigue at follow-up: OR 0.52 (95% CI 0.29 to 0.93) (online supplementary appendix 12A). A second analysis was performed comparing the results of the Functional Assessment of Chronic Illness Therapy—Fatigue Scale (FACIT-FS) at follow-up, pooled from two publications describing three different studies (online supplementary appendix 13A). The FACIT-FS score is ranging from 0 to 52. A score of less than 30 indicates severe fatigue. The higher the score, the better is the quality of life. Data from these different studies were not particularly homogeneous (I²=66.7%), and no significant difference between SVR versus non-SVR patients was observed, as shown by the SMD=0.07 (−0.29 to 0.43, P=0.6936). Finally, an analysis using the change from baseline of Fatigue Severity Scale (FSS) scores was performed. The FSS score is ranging from 0 to 7. The higher the score, the higher is the fatigue. A score of more than 5.5 indicates severe fatigue. A significant difference was found when comparing the FSS change from baseline of SVR versus non-SVR patients using data from five different studies: SMD=0.30 (0.06 to 0.54, P=0.0130) (online supplementary appendix 13B), although heterogeneity was significantly high (I²=86.6%) (online supplementary appendix 5). According to GRADE score attributed, the strength of evidence is ‘very low’ for all three of these analyses. Although two studies were identified that permitted a direct comparison of depression between SVR versus non-SVR in the HCV populations, no significant reduction in the presence of depression was observed after SVR achievement: OR 0.59 (95% CI 0.11 to 3.07) (online supplementary appendix 12B). According to GRADE score attributed, the strength of evidence is ‘very low’. 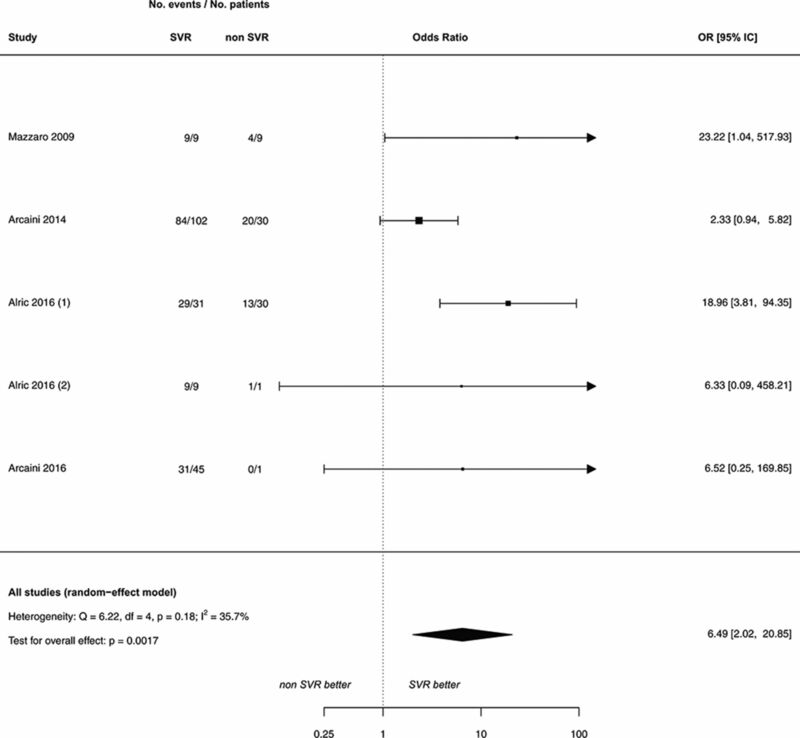 Although progressive hepatic fibrosis is responsible for most HCV morbidity and mortality,19 studies with a 5-year to 12-year follow-up have suggested that non-cirrhotic patients in particular benefit from a significant decrease in mortality on achieving SVR.20 In this meta-analysis, data were extracted from 48 predominantly prospective and retrospective cohort studies that examined the effect of achieving SVR on a variety of extrahepatic outcomes in HCV-infected patients. The combined data from four of these HCV study populations, including more than 7000 patients, confirmed that achieving SVR reduced extrahepatic mortality (OR 2.29, 95% CI 1.49 to 3.52; P<0.001). In addition, publications addressing 12 recognised extrahepatic indications were sought. Patients achieving SVR were found more likely to have an improvement in cryoglobulinemia vasculitis (OR 27.24, 95% CI 10.99 to 67.53; P=0.01). SVR was found to have improved objective responses in five publications studying malignant lymphoproliferative diseases (OR 6.49, 95% CI 2.02 to 20.85; P=0.0017). Among patients without diabetes, those achieving SVR were less likely to harbour insulin resistance (OR 0.42, 95% CI 0.33 to 0.53; P<0.001), and SVR tended to protect patients from developing diabetes (OR 0.27, 95% CI 0.18 to 0.40). Lymphoproliferative disorders, which range from cryoglobulinemia vasculitis to B-cell lymphomas, used to play a major role in HCV extrahepatic mortality; these indications were the most frequently represented in this meta-analysis. Cryoglobulinemia vasculitis is potentially fatal, with a reported 10-year mortality rate of up to 40%,21 and a risk of developing non-Hodgkin’s B-cell lymphoma 30 times greater than that of the general population.22 A higher incidence of B-cell non-Hodgkin’s lymphoma has been linked to HCV in a meta-analysis of seven studies that included over 10 000 patients,23 as well as by large retrospective studies in the US population.24 In cases with concomitant HCV infection, certain B-cell lymphomas have been reported to have distinct characteristics,25 26 as well as higher mortality rates.24 Antiviral treatment is part of the recommended first-line therapies in such cases.13 27 Of note, the statistical point of view of the present meta-analysis may have blurred that the reversibility of some malignant lymphoproliferative diseases may depend on histological subtype. Metabolic disorders have also been closely linked to HCV infection.28 Here, the effect of SVR on insulin-related metabolic diseases represented the second largest group of studies found. The prevalence of insulin resistance or type 2 diabetes mellitus is elevated among HCV-infected patients compared with the general population.28–30 The development of these conditions may exacerbate the progression of hepatic lesion during HCV infection.31 32 According to some,33 34 although not all,35 international guidelines on antiviral treatment should be promptly initiated in HCV-infected patients with insulin resistance or diabetes, along with standard care for these diseases.13 36 Frequently prescribed medications for diabetes such as sulfonylureas and insulin have been suggested to increase the risk of hepatocellular carcinoma in HCV-infected patients,37 thus the control of type 2 diabetes should be achieved with other means in patients with underlying advanced liver disease. Analyses of the effect of successful HCV antiviral treatments on other extrahepatic indications were hindered for a variety of different reasons. Despite the identification of 10 different studies comparing the impact of SVR on fatigue, the use of different scoring assays impeded the analysis of much of this data. Likewise, although depression has been reported to occur in 25% of HCV-infected patients,29 the two study populations pooled herein were unable to provide conclusive evidence for the reduction depression on achieving SVR. In the case of studies exploring renal impairment risks, a single population appears to have been analysed in all three of the publications identified. Limited data noted the positive effect of SVR on arthralgia and cardiovascular risks, but only limited statistical analysis was feasible, and no studies that addressed the sicca syndrome, porphyria cutanea tarda, myalgia or cognitive dysfunction were identified. More broadly, those analyses that were feasible bear a number of limitations. Subpopulations of larger studies were extracted to permit comparisons; as such, none of the data used for meta-analyses could be considered as originating from randomised populations. In addition, the very high SVR rate (>90%) obtained with new interferon-free direct-acting antiviral regimens (reviewed in Spengler38) has had unfortunate repercussions for meta-analyses. These remarkable success rates, along with the relatively short follow-up required for achieving SVR and limited reporting on other clinical outcomes, have been discussed.39 In many such studies, after the extraction of extrahepatic subgroups no internal non-SVR controls remained,40 41 thus prohibiting data extraction for statistical analysis in this study. In future clinical trials, longer-term follow-up of patients, and more extensive reporting of a variety of clinical outcomes, will be vital to promote a more thorough understanding of the risk–benefit profiles of these treatments. Finally, interferon alpha may have additional positive effects compared with DAA on some extrahepatic manifestations such as lymphoproliferative diseases. Conversely, DAA are probably better for depression or insulin resistance. In conclusion, extrahepatic manifestations in HCV-infected patients are either rare but very severe on the short term (ie, cryoglobulinemia vasculitis, lymphoproliferative diseases) or very frequent with a potential severity on the mid-long term (ie, insulin resistance, type 2 diabetes, cardiovascular diseases, renal impairment, etc). In most cases, they are independent of the severity of the liver disease. Antiviral therapy can reduce hepatic manifestations of HCV and also many extrahepatic manifestations related to HCV when SVR is achieved. WHO. Global hepatitis C infection report. 2017 http://www.who.int/hepatitis/publications/global-hepatitis-report2017/en/.
. Extrahepatic manifestations of chronic hepatitis C virus infection. Dig Liver Dis 2014;15:8.
. Aasld guidelines for the treatment of hepatocellular carcinoma. Hepatology 2017;28:29086.
. Direct antiviral agents (DAAs)—a new age in the treatment of hepatitis C virus infection. Pharmacol Ther 2017;10:30246–2.
. Direct-acting antivirals for chronic hepatitis C. Cochrane Database Syst Rev 2017;18. Contributors Concept and design: PC, ACD, CC, DS. Procedures: PC, ACD, CC, DS. Writing of article: PC, DS. Funding This work was supported by WHO and UNITAID. Main results were presented at the WHO meeting of the Guidelines Development Group for the Hepatitis C Treatment (Geneva, Switzerland, September 2017). It was also supported by an unrestricted grant from Gilead. Competing interests PC has received consulting and lecturing fees from Abbvie, Astra Zeneca, Bristol-Myers Squibb, Gilead, Glaxo Smith Kline, Janssen, Merck Sharp Dohme, Roche, Servier and Vifor. PC has received grants from CNRS, INSERM, Université Pierre et Marie Curie, ANRS and WHO. DS has received consulting and lecturing fees from Medimmune, Abbvie, Bristol Meyer Squibb, Roche, Servier, Gilead, AstraZeneca and GlaxoSmithKline.